Earlier this week, one of the Obama administration's top diplomats, Samantha Power, claimed that Russia was responsible for the stunning Italian election outcome, hinting that anyone who dares to point out or discuss the social and economic woes of Europe's grand experiment - and certainly Europe's "refugee problem"- is a Russian operative. In that case, Deutsche Bank must be the Frankfurt office of the KGB, because in an overnight note, the German lender reported something especially troubling for Europe's future and viability: populism has risen to the highest level since World War II. Commenting on the recent Italian election, Deutsche Bank's Jim Reed writes that relative to other political events in recent years, Italy's general election over the weekend was a relatively calm affair for markets, despite the uncertain outcome. Which was to be expected: in previous political events, the ECB forcefully stepped in and vowed to intervene if turbulence emerged. However, as Reid adds, "it's hard to get away from the fact that the overall result was another resounding vote for populism. Indeed over 50% of votes submitted was for a populist party, including of course the party with the largest percentage - the Five Star Movement - and a possible kingmaker in subsequent coalition talks - the Northern League." Making matters worse for the "globalist" establishment, arithmetically the anti-establishment alliance between Five Star and the Northern League has an outright majority, and While it's difficult to see such an alliance forming, this shows the power of populism in recent years which has followed a vote for Brexit, President Trump and strong performances for the likes of the National Front party in France and the Alternative for Germany party in Germany. The chart below shows Deutsche Bank's populism index updated for the Italian election result. 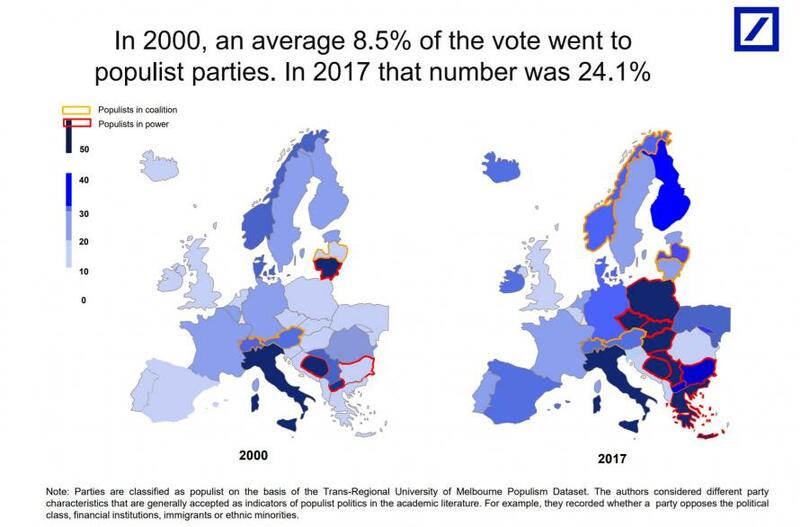 The chart shows that the percentage of votes for populist parties on a population weighted basis is around 32% - a level its largely held since the Trump inspired surge in 2016. 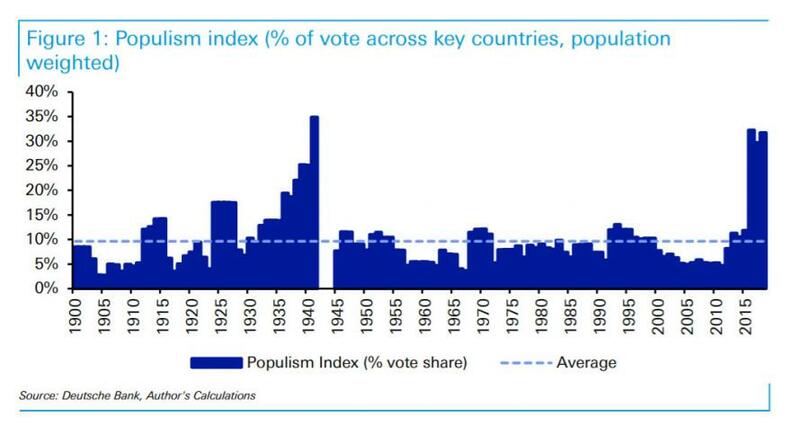 In fact, you have to go all the way back to the WWII period to find the last time that populism had such support. A focus just on Europe shows that the continent with the high double-digit youth unemployment has become a hotbed for anti-establishment sentiment, which has everything to do with the economy, and lack of opportunities, and nothing to do with Russian operatives, much to Samantha Power's chagrin. As of now the rise in populism hasn't yet destabilised markets however we find it difficult to get away from the fact that uncertainty levels are bound to remain high while such power brokers remain in major elections. Indeed the unpredictability of Trump's policies is such an example, with the recent tariff threats which have subsequently escalated market concerns about a trade war being one. At a time when global central banks are moving towards an unprecedented era of tightening and dealing with years of massive asset purchases, risks from rising populist support has the ability to seriously disturb the prevailing equilibrium of the last few years and subsequently markets. While Reid notes that this is more of a slow burning issue over the next few years, he concedes that populism remains the biggest threat "to the post-1980 globalisation/liberalism world order." The biggest risk, of course, is that the last time populism and populist anger was this high, the world was wrapped in a war that killed tens of millions of people. One wonders what happens this time when the biggest distraction ever created for mass consumption: the idea of paper wealth and unbooked profits - evaporates following the next market crash, and how many millions will die as a result. One thing is certain: the global drums of war have not beaten louder in almost a century.